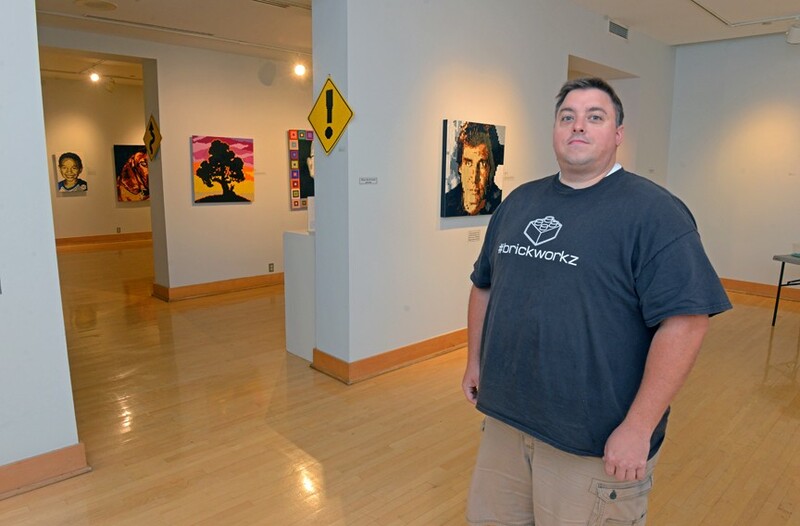 Brian Korte’s “Vibrance” Raises Legos to the Level of Fine Art | Arts and Culture | Style Weekly - Richmond, VA local news, arts, and events. 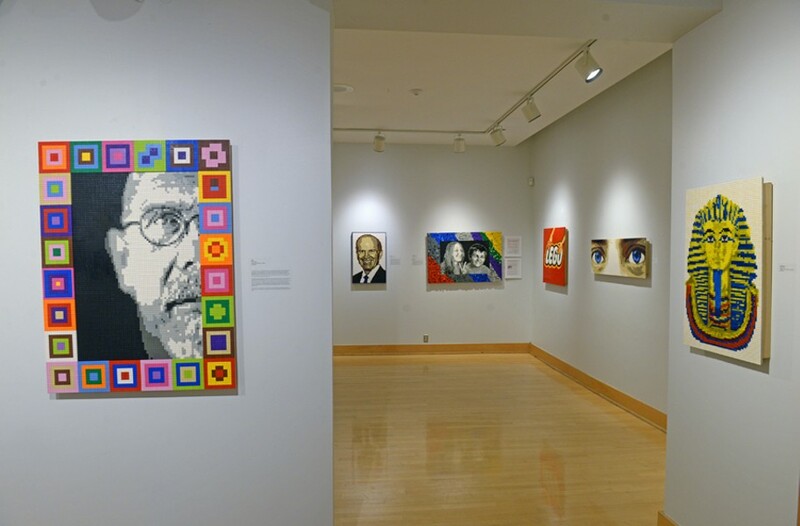 Scott Elmquist Brian Korte made this portrait of artist Chuck Close with Legos. Brian Korte puts serious labor into his photo-realistic portraits and colorful sculptures, like the giant Slurpee commissioned by Coca-Cola. His medium? Lego bricks. But when his 12-year-old company Brickworkz ships those time-consuming pieces, he usually never sees them again. That's why his show "Vibrance" is an unusual opportunity. The pieces are on display at the Cultural Arts Center at Glen Allen until July 15. "It's very rare when I actually get them out on display," he says. "This is special, too, because you get to see two rooms full of Lego mosaics, either ones I've held on to or ones borrowed back from people." Much of the exhibit is autobiographical, Korte says. Visitors can also enjoy optical pleasures like a "lenticular mosaic," which presents a portrait of Han Solo when viewed from the left angle and Chewbacca from the right. At one point, Korte goes meta. His scene depicting yellow Lego figurine heads is made out of those same heads. And then he's got serious works, including one attempt at the Madonna and child genre. Korte says this piece became possible once he purchased rare translucent base plates, which were made only for Lego employees in Denmark. Paying homage to the stained glass marvels which inspired his Madonna, Korte backlit the work with a custom-built light box. "Building that light box was tough, and it resulted in a lot of broken glass," he jokes. The Madonna happens to be one of Lauren Hall's favorite pieces, next to a Roy Lichtenstein homage. As visual arts manager at the Cultural Arts Center, she wanted the exhibit to flow, rather than cram themes and similar colors together. "Vibrance" marks Korte's third presentation at the center. Included are some of the botanically-inspired mosaics that were originally on display at Lewis Ginter Botanical Garden in 2016. "Brian's definitely taking his art to new heights," Hall says. "It's been neat seeing him progress." Korte says he's ready for challenges, especially if they produce a good portrait. "Portraits are my favorite subjects," he says. "They all have a story behind them." "One of the limitations is colors," Hall says. "There's only so many." Korte finally got to use his magenta bricks when someone commissioned a rainbow trout. In Korte's early days, he was mapping out his creations on graph paper first, which took an endurance-busting 45 hours. He's got digital tools now, but he still has to trust everything to his small staff, which usually comes down to himself and his friend Shane Halloran. "Shane's a natural," Korte says. People do reach out with offers to work for him, he says. He's looking to expand in the near future. An especially popular Brickworkz service is memorial portraits of lost loved ones or pets. A selection of these portraits will be on a memorial wall. "This is some of the more meaningful work we do at Brickworkz, helping families in their grief," Korte says. "Some mosaics feature their lost children's own Lego elements to keep those fun memories alive." Korte's go-to piece is the single-peg brick — literally the basic building block of the Lego universe. Every project is plugged onto a base plate, which Korte calls "my canvas." And yes, he does fastidiously organize his bricks by type. A Lego purist, Korte never uses off-brand bricks. "Lego is actually very exacting in how they manufacture their pieces, down to the ten-thousandth of a millimeter," he says. "They even throw away their molds after a certain number of uses." Enthusiastic to inspire the next generation of Lego artists, Korte teaches summer classes at the Virginia Museum of Fine Arts. "Anyone who's been a kid and played with Legos is excited about this exhibit," Hall says. "It's pure fun." On the exhibit's opening night, she even watched adults dig their hands into the buckets of Legos made available. Of course, Korte still kindles that spark of discovery within himself. "Vibrance 2018: Lego Art by Brickworkz" is on display at the Cultural Center of Glen Allen until July 15.